A Logic Model outlines various program components, including inputs, activities, outputs and outcomes, usually in a table format. It starts with the program and charts its components in a linear or hierarchical fashion, without showing why activities are expected to produce those outcomes. 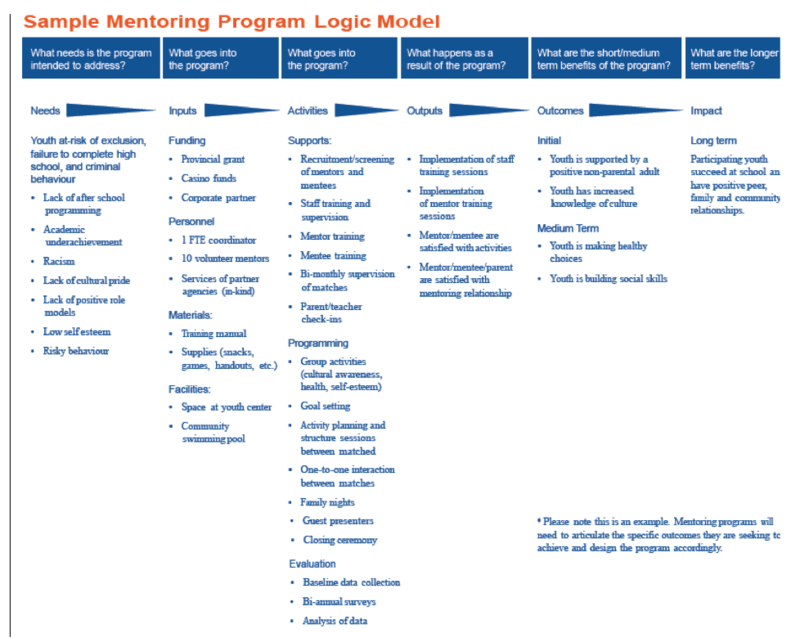 For example, the logic model below shows that the program is working on addressing a lack of after school programming and concerns around academic underachievement, lack of positive role models, etc. (needs). It also shows what is being put into the program in terms of funding, personnel, materials and space (inputs). It lists the activities that will take place as part of the program, and the immediate outputs it will be able to demonstrate (occurrence of activities and satisfaction with activities). Finally, it lists the outcomes and impact it hopes to achieve in the short-term, medium-term, and longer-term. A Theory of Change is a visual depiction of the link between your activities and outcomes, including how and why the desired change is expected to come about (i.e., a causal model that includes assumptions and justifications). It typically starts with the end goal of an initiative in mind (the desired impact), then works its way backwards to decide on the program approaches that will most likely result in that impact. For example, the Theory of Change below shows that the program seeks to support youth in continuously developing and integrating new skills in order to fulfill their potential. It tells us that the first step of the program is to identify sparks, then promote a growth mindset, identify indicators of thriving, and build goal management skills. It tell us that adult guides must support youth in specific ways in order for them to be on a road to a hopeful future. 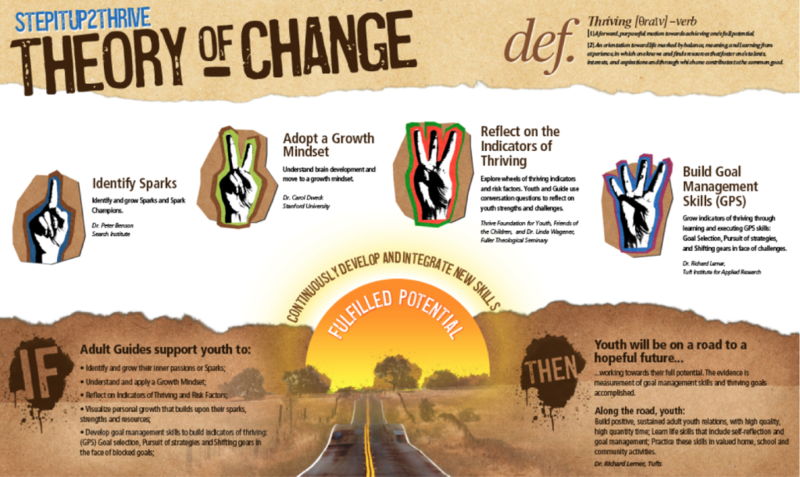 A theory of change is more focused on how a program intends to produce desired outcomes. 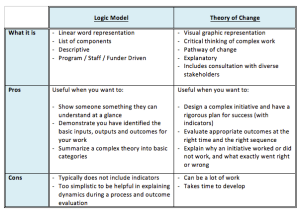 Both the Logic Model and the Theory of Change have their uses. The Logic Model can be sufficient when outlining a fairly simple project. The Theory of Change is increasingly being encouraged when designing a more complex and comprehensive initiative, so you can articulate and track the change you hope to create. Clark, H. & Anderson, A.A. (2004). 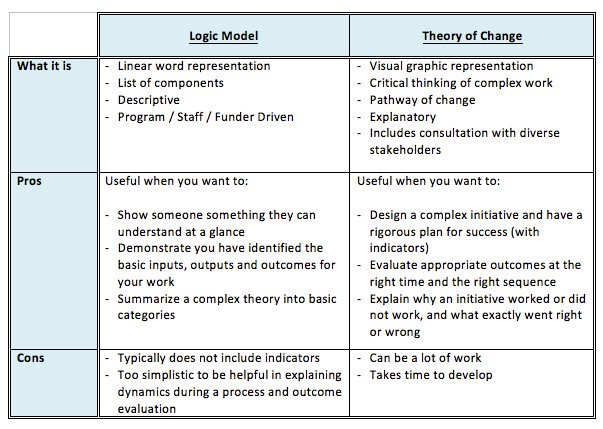 Theories of change and logic models: Telling them apart. Presentation at the American Evaluation Association Conference, Atlanta, Georgia, November 2004.